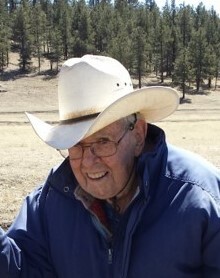 Glen Allen McCarty, 93, of Reserve, New Mexico, passed away on February 6, 2019 in, Las Cruces, NM. He was born September 19, 1925 in Reserve, NM to F.D. (Dude) McCarty and Pearl (Ward) McCarty. He is survived by his two daughters: Glenna (Dean) Honeyfield of Blairstown, MO and Shirley Peralta of Reserve, NM; and one son; Richard (Brenda) McCarty of Reserve, NM; ten grandchildren; fourteen great grandchildren; one brother-in-law, Earl Harvey of Albuquerque, NM and several nieces. He was known as a life-long rancher by most. He was much more, he was a World War II Veteran. He was a strong businessman and created many different businesses. In his golden years, he became a traveler and adventurer “lol”. He liked to hunt for rocks and enjoy time with special friends he met along the way. He was well traveled and lived a full and happy life, he did as he wanted, and no one can argue that. Between riding horses again and rock hunting he is having a blast I’m sure up in heaven. Graveside Services will be held in Reserve, New Mexico, February 13th at 1100am at the Reserve Cemetery. Arrangements are being handled by Baca’s Funeral Home.